Don Granato was head coach of the Chill during their final two seasons in Columbus, including a dramatic win in the final ever regular-season game that clinched the 1999 ECHL North Division, the second title in franchise history. The Downers Grove, Ill., native was also a player on the Chill’s inaugural-season team in 1991-92 and played his only two pro seasons in Columbus. He collected 90 points (26 goals, 64 assists) in 103 career games before retiring. Before signing with the Chill, Don played for the University of Wisconsin from 1987-91 and had 88 points (45-43) in 162 games. He also helped the Badgers win the 1990 NCAA title along with his soon-to-be Chill teammate, Kurt Semandel, and Mark Osiecki, the current Ohio State men’s hockey coach. 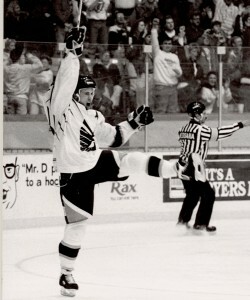 After retiring, Granato sharpened his coaching skills with the Green Bay Gamblers of the junior United States Hockey League from 1994-97 and earned the distinction of becoming the first coach in the league to lead a team to back-to-back regular season championships. Don had a 33-30-7 record his first season in Columbus. For the 1998-99 season he added the general manager’s duties as the Chill went 39-24-7 to edge Peoria by a point for the division crown after having not led the entire season. His two-year record was 72-54-14. 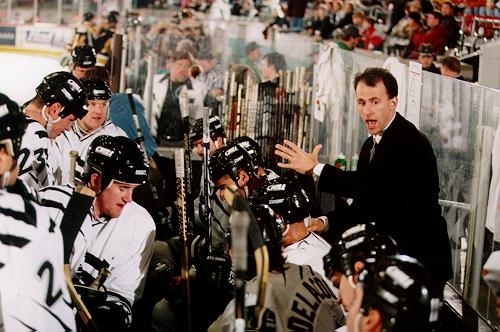 The Chill suspended operations after the 1999 season (later to become the Reading Royals) to make room for the start up of the Columbus Blue Jackets NHL expansion team and Don moved on to coach the ECHL’s Peoria Rivermen for one season, capturing the Kelly Cup in 2000. One of his key players was former Chill teammate Jason “Smurf” Christie. Soon thereafter Don became the fourth consecutive Chill coach to be promoted to a higher level as head coach of the St. Louis Blues’ AHL affiliate, the Worcester IceCats. 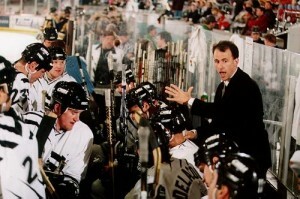 Don was named AHL Coach-of-the-Year during his inaugural campaign of a five-year stint. He also became the second Chill coach to become an NHL assistant when he was promoted to the Blues (2005-06). He has since coached the Chicago Wolves (AHL) and most recently was a scout for the Vancouver Canucks. USA Hockey’s National Team Development Program named Don the U.S. Under-17 head coach on August 15, 2011 – the same position once held by former Chill coach Moe Mantha. Part of a well-known hockey family, Don is the brother of Cammi and Tony and the brother-in-law of Ray Ferraro. Don was born on Aug. 11, 1967.